The book brings together reviews of books published between 2012 and 2015 about the Middle East and North Africa. The subject coverage spans the humanities, arts, and social sciences but excludes books on science and technology. Reviews are written by experts in the respective subject area and offer detailed, informative and critical information designed to assist scholars, as well as librarians. These published reviews are supplemented by regularly published reviews that appear on the Middle East Media & Book Reviews web site, membr.uwm.edu. 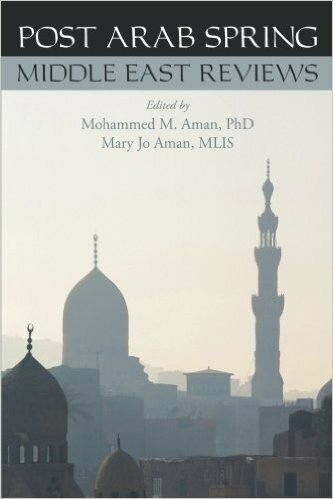 About the Editors Mohammed M. Aman, PhD is Professor and former Dean of the School of Information Studies and Interim Dean of the School of Education at the University of Wisconsin-Milwaukee, USA. He is the founder and Editor-in-Chief of the Wiley-Blackwell/Policy Studies Organization (PSO) peer reviewed journal Digest of Middle East Studies (DOMES) and the online journal Middle East Media & Book Reviews (MEMBR).His academic experience includes teaching and senior administration at St. John’s University and Long Island University in New York and since 1979 at the University of Wisconsin-Milwaukee. Professor Aman is the author of more than 200 articles, book chapters and is author or editor of fourteen books. Mary Jo Aman, MLIS is Associate Editor of the Digest of Middle East Studies (DOMES) and the Middle East Media and Book Reviews (MEMBR) and former Editor of the Newsletter of the International Board of Books for Young People (IBBY). She is the co-editor of Middle East: Conflicts & Reforms; and New Directions in the Middle East. (PSO/Westphalia Press, 2014). Ms. Aman held a number of academic teaching and administrative positions. Ms. Aman has taught at St. John’s University in New York; Cardinal Stritch College and UWM in Milwaukee, WI. She is the recipient of a number of awards among them: Wisconsin State Senate Recognition Award; Citation of Merit from the Milwaukee Board of Supervisors; and the University of Wisconsin-Milwaukee Ernest Spaights Award for Outstanding Contributions to UWM.